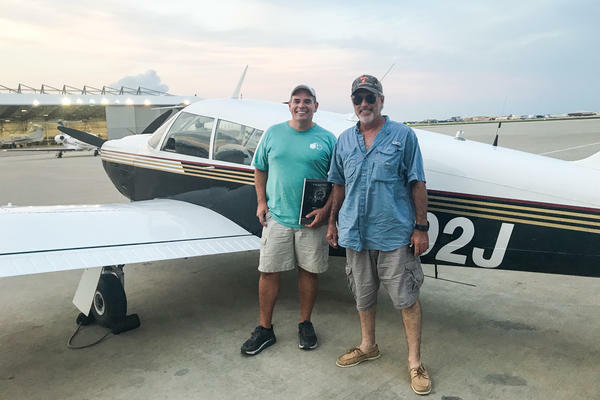 Pilots Andy Cook (left) and Rocky Breaux flew in from Houma, La. with diapers, toys, games, books and strollers packed. They were part of the ad hoc "Cajun Airlift." Dr. Jennifer McQuade (left) and Dr. Regina Troxell wheel strollers full of donated children's books through the shelter. 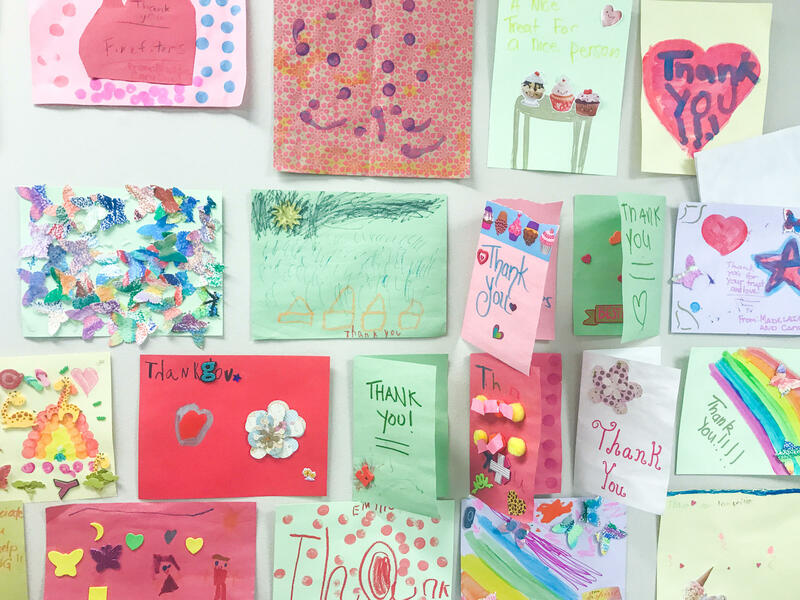 Thank you cards from children who received meals cooked by volunteer chefs on the wall at the kitchen. Volunteer chefs Matt Wommack, left, and Richard Knight prepare meals for first responders and evacuees. These will be sent out around Houston and well beyond, to Beaumont, Texas. "We're gonna do whatever it takes to help out Texas. They've always helped out Louisiana, so we're just returning the favor. We've been through Juan and Andrew and Katrina; fought 'em all. Takes a team." Working alongside FEMA and aid organizations like the Red Cross are a legion of individual volunteers, some of whom have found themselves unexpectedly thrust onto the front lines of disaster response. That army of volunteers — many from out of state — have scrambled to help in any way they can. The flyers figure it costs them about $625 out of their own pockets to make the trip, but they didn't think twice. "We've been blessed, and we're just helping out," Breaux says. "Everybody is a brother and sister on the Gulf Coast," Cook adds. "These storms create the needy and they create the providers. We have a lot of people providing around here. It's nice to see." As night falls, the pilots point their plane back toward Louisiana for the flight home. They and other pilots of the "Cajun Airlift" will be standing by, ready to help out with another supply mission as needed. With this delivery made, it's up to Dr. Regina Troxell, a pediatric neurology fellow at the University of Texas-Houston, to ferry the new supplies to the NRG shelter. For the nearly two weeks since Harvey hit, Troxell has spent countless hours and sleepless nights volunteering at the emergency shelters set up for Harvey evacuees, helping with medical needs or just about anything else that needs doing. "In the moment," she says, "we just do what needs to be done. You know that there's a need, and you're there and you're capable, so you do the work." Troxell loads the dozen bags and boxes flown in from Louisiana into her blue Toyota RAV-4. The next morning, she takes them to the cavernous convention center-turned-shelter. The shelter has received so many offerings of clothes and supplies that there are signs posted all around the perimeter: "no more donations accepted." 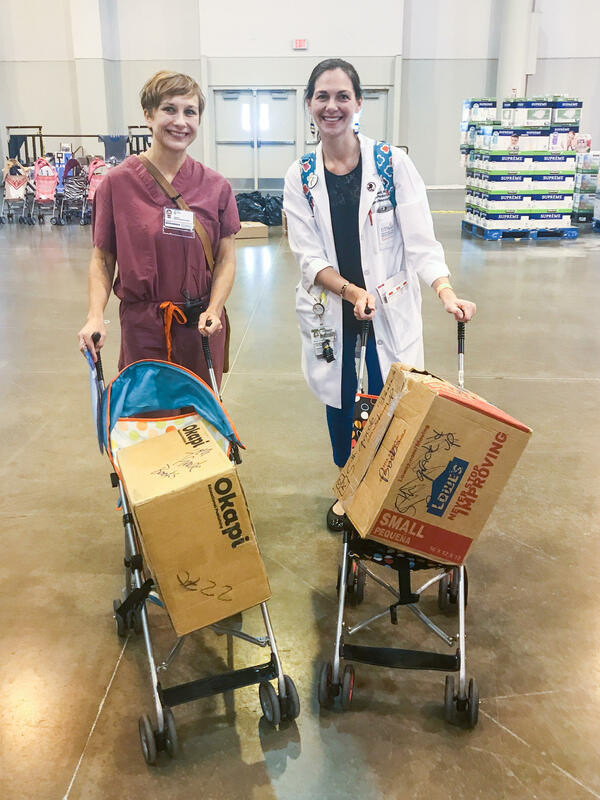 But Troxell and the other volunteers had crafted a specific wish list of things to help with the smallest Harvey evacuees: portable crib and strollers, so moms wouldn't have to tote their babies the quarter-mile length of the convention center. The Houma pilots brought strollers, as well as lots of toys, games, puzzles and children's books. Also on board: a batch of letters and cards of support from kids in Baton Rouge who endured a bad flood a year ago. As soon as Dr. Troxell brings in the new supplies, another volunteer rushes over: "I heard you guys have some toys!" Barbara Osterwisch says. She's helping a new, stressed-out family get settled into the shelter, and the kids — who have virtually nothing — noticed toys on some of the other cots. Osterwisch gratefully heads back to the family with some games, a Disney Tiana doll, and a Buzz Lightyear toy, along with one of the cards sent by the Baton Rouge children. It's written in purplish crayon on bright yellow paper: "Dear friend," it reads. "I hope you get into your home quickly. Halley." By now, 10 days after Harvey hit, the NRG shelter appears to be a small, well-organized city, with separate areas for legal advice, immigration consultations, veterans' services and driver's license renewals. The big disaster response teams are here in force: FEMA and the Red Cross. Alongside them is Dr. Jennifer McQuade, a melanoma oncologist at Houston's MD Anderson Cancer Center. The first day of the storm, as Harvey swamped Houston, she made her way to the city's emergency shelter to donate blankets and socks. When she arrived, she found a chaotic scene. Evacuees were being delivered in the back of dump trucks, soaking wet and sometimes wounded, but, as McQuade discovered, there was no medical team in place. "There was one table that was set up," she recalls, "that had some ibuprofen, some Tylenol, a little bit of Neosporin, and some Band-Aids. That's it." So McQuade was spurred into action. She got on Facebook and made an urgent plea for help to the Physician Moms Group, some 70,000 women strong, all across the country ("women doctors, getting it done," she says with a grin.) Soon after McQuade posted, a doctor from Louisiana — Ashley Saucier — wrote back. "She said, 'Are you running the medical shelter?'" McQuade recalls. "And I said, 'No! I'm a medical oncologist! I'm absolutely not running a medical shelter!'" But Saucier knew from her own experience during last year's Baton Rouge flood that you can't wait for the Red Cross or FEMA to take charge. "Those take time," McQuade remembers Saucier telling her. "Any time you're dealing with large organizations, they're amazing, but it takes time. In the meantime, somebody needs to be taking control, and if there's nobody else there doing it, it needs to be you." So McQuade took charge. Harnessing the power of social media, she enlisted doctors, pharmacists and nurses to come volunteer, eventually having to turn some away because the response was so great. She also put out the call for medical supplies, and those started pouring in — everything from insulin to anti-psychotic drugs to EKG machines and a crash cart, delivered by a medical supply company owner who drove through the night from Atlanta — some 800 miles away. Finally, McQuade says with a laugh, she's found a good use for Facebook: "It's something that I'd seen as a frivolous distraction, that I kept on trying to quit but i couldn't quite make myself quit. I'm really glad that it showed its true value with this." Houston's restaurant community has also turned out in force to volunteer their time and talents in Harvey's wake. In an industrial downtown kitchen, chef Richard Knight oversees a crew hustling to prepare huge aluminum pans of hot meals for Harvey evacuees and first responders, not just in Houston, but all over southeast Texas. One chef swiftly slices mounds of juicy pork shoulder and douses them with gravy. Another arranges stacks of roasted chicken quarters. When Knight labels the pans in magic marker — mashed potatoes, veggie chili — before he sends them on their way, he draws a heart around the words. 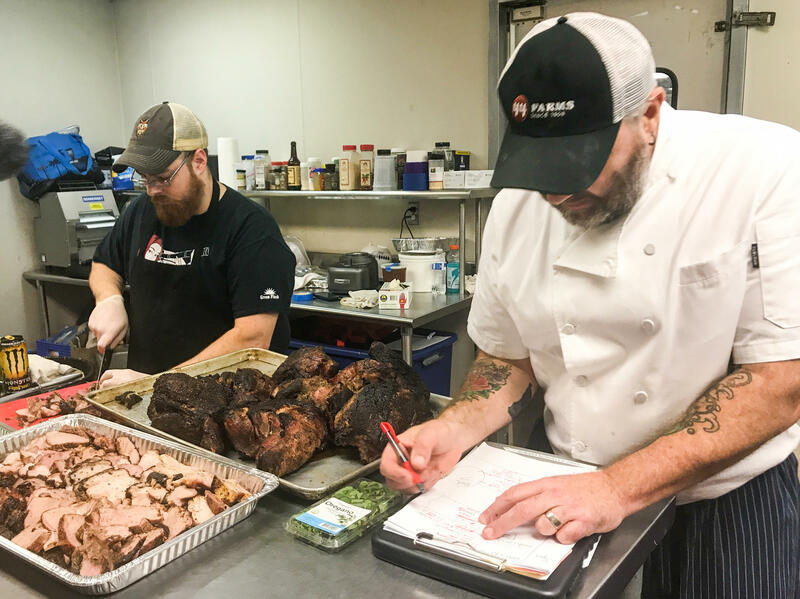 As the scope of the Harvey flooding became clear, Knight says he put out this call to his fellow chefs across the city: "OK guys, come on, now's the time to show your mettle. If you can get to your kitchens safely, get out there. Start cooking some food." It's one way to provide comfort in desperate times. "If I can make people happy for five minutes by filling their bellies, that's what I'm gonna do," Knight says. This kitchen collective has cooked up tens of thousands of hot meals post-Harvey, not to mention mountains of sandwiches prepared by an assembly line of volunteers. To coordinate the deliveries, a volunteer logistics team created a website that lets them match restaurants or suppliers that have food to donate, with those who need it. Claudia Solis, an eighth-generation Texan, works on logistics. She's exhausted from the effort and emotionally frazzled, but gratified by what she has seen. "There's a kindness in Houston," she says. Her voice catches, and she pauses to collect herself. "We're just kind," she goes on. "They're your neighbor, and you have to help, and it's beautiful. But it's also that it required this tragedy for us to see it." Organize as much as you can ahead of time. Line up kitchens and transport and volunteers. Social media will be your best friend. Above all, they advise, don't wait.